Advanced menu modules render navigation menus on your templates, based on various settings and the menu trees set up in Content Settings > Advanced Menus. This article explains the markup that is outputted by menu modules and goes over some of the CSS selectors that can be used to style them. 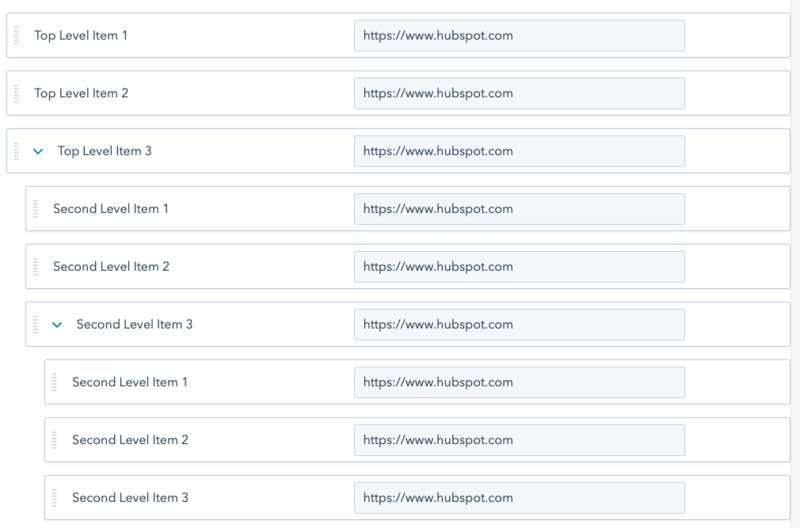 Like every other module in HubSpot, menu modules are wrapped in module wrapper markup. These div and span tags make the module editable via the content editor UI and include classes for the module type as well as Template Builder's responsive grid. The menu markup of simple and advanced menu modules is the same, with the exception of some of the classes applied to wrapper and menu div. The actual menu renders as an ul wrapped in a class="hs-menu-wrapper" div. The hs-menu-wrapper div has additional classes based upon the advanced menu modules settings. Within the ul each menu item is an a tag wrapped in a li. The li tag has a class that indicates the depth of the item in the menu tree (ex. hs-menu-depth-1). If the li item contains a nested child menu, it will have the additional class of hs-item-has-children. The child menu renders as a nested ul with the class hs-menu-children-wrapper. When you visit a page that is included in your menu tree, the class active-branch is added to the parent li items and a class of active is added to that page's particular li item. Below is the markup of the advanced menu tree depicted here. Advanced menu module settings control what markup gets rendered by HubSpot and add classes that be used to style certain menu features. The Advanced menu type and the Max levels settings control what parts of the menu tree render in the menu markup. Additionally, the Menu control selects which advanced menu to use. The Orientation setting adds a class hs-menu-flow-horizontal or hs-menu-flow-vertical to the menu wrapper div. This class can be used in CSS selectors to style horizontal and vertical menus differently. The Enable Flyouts? setting adds the class of flyouts or no-flyouts to the menu wrapper div. This class can be used in CSS selectors to target menus with or without dropdowns to hide them based upon this setting. Below are some example CSS selectors that can can be used to style HubSpot menus. You can see some of these selectors in use with CSS declarations in HubSpot's Boilerplate CSS file.